It was a simple plan. 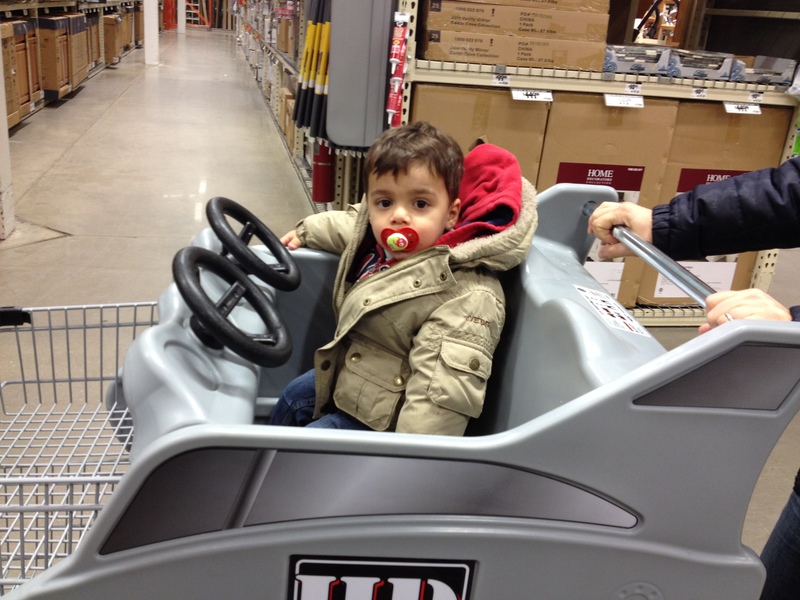 When the baby woke up from his nap, we would take a quick trip to The Home Depot. I only needed a few things. It was a Friday, which is my day off as well as our designated Mommy-and-Theo day. I usually try to do at least one special/fun thing every Friday, but once you get to the tail-end of February, and you’re over the library and the finger painting, and you’d sooner stand outside naked in the 5-degree weather singing the Thomas & Friends theme song than make another trip to the skeevy children’s “museum” located in an office park a couple of towns over, you must get creative with your definition of “special” and “fun.” Hence, the trip to Home Depot. I figured the kiddo would have a grand time riding in one of those special shopping carts that look like race cars. And he loves browsing in the lawnmower and power saw departments. If we were really lucky, maybe we’d even see a forklift carting some lumber around! See how much fun he’s having? As is often the case, the reality bore zero resemblance to the daydream (e.g., the recurring fantasy I have, before every trip to the salon, that this will be the visit when I finally break out and become one of those people who have hilarious and juicy conversations with their hairdressers, only to end up sitting in awkward silence for pretty much the whole time). First of all, I don’t really know anything about home improvement, even though I have watched many episodes of Rehab Addict. The “big project” I was working on involved replacing a few doorknobs around the house. And although I am embarrassingly proud of the fact that I did, in fact, install them myself, picking them out turned out to be the most difficult part of the whole process. 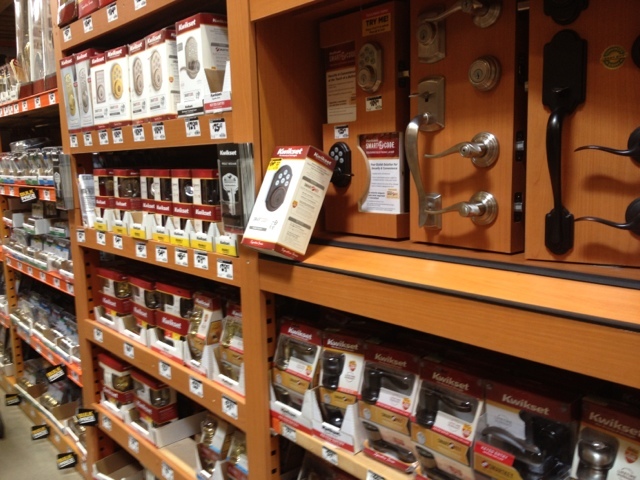 This was partly because there are about a million different doorknob styles and brands and finishes available at The Home Depot, but mostly because it’s really hard to focus on anything when you are with a small person who won’t stop whining about how he wants to get out of the shopping cart. Indeed, he could not have cared less that the rolling prison in which he was confined was designed to look like a race car. I agreed to take him out, with the naive proviso that he stay close to me, and his little Stride-Rites had barely brushed the floor when he took off in the direction of the screen doors. I carried him back to the cart, sweating in my puffy coat, and curtailed his shrieks of protest by pulling a squeeze pouch from my purse. In the precious moments of quiet that followed, I managed to pull the correct doorknobs from the shelves and make my way over to the lighting section. The second blow of the day came when I could not, for the life of me, find the bathroom sconces. There were hideous chandeliers and pendant lamps and track lighting a-plenty, but what to do if all you wanted was a simple, cheap lighting fixture for your powder room? If you were me, you sped over to the bathroom section, making vroom-vroom sounds in an increasingly desperate bid to keep your toddler from having a full-on meltdown, only to find several sconces on display but none, alas, in boxes. You paused when you heard a familiar beep, beep, beep and shouted, a little too enthusiastically, “It’s a forklift!” which amused your son for about five seconds before he started getting agitated again, at which point you magically produced yet another snack from your purse—this time Cheddar Bunnies (which are basically Goldfish except for the fact that they are made with “all-natural” ingredients and also the fact that they are shaped like bunnies). But no sooner did you hand the crinkly foil bag to your son, warning him to be careful not to spill it, than he turned the thing upside down, dumping every last Cheddar Bunny onto the floor beneath the cart. You poor things! How on earth did you manage to survive?